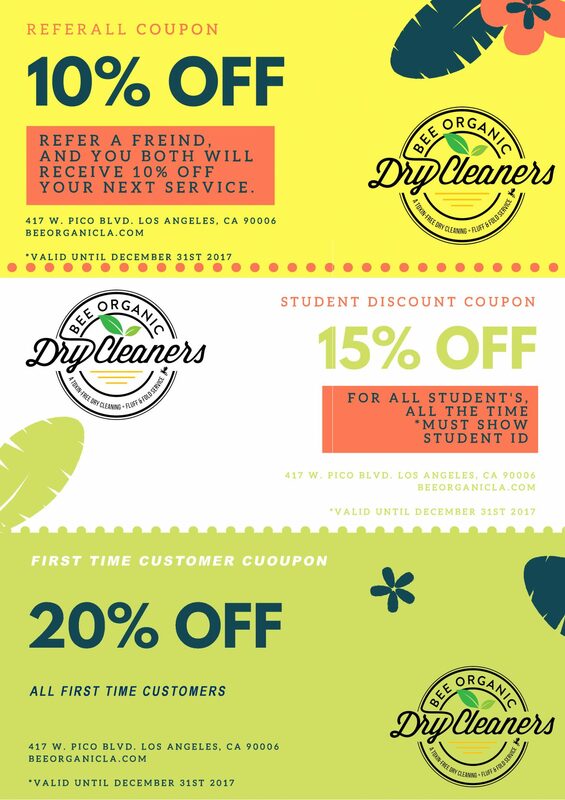 We are proud to say, we are Los Angeles’ ONLY 100% toxin-free cleaners. 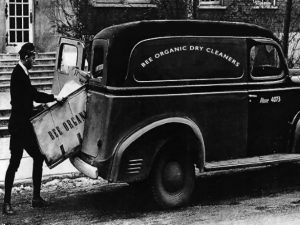 At Bee Organic we use strictly water based, biodegradable detergents for all our dry cleaning & laundry services. WE OFFER THREE EASY OPTIONS! 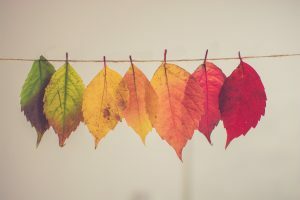 Professional and gentle cleaning techniques are tailored for each individual garment in order to extend the life of your cherished pieces — our luxury cleaning method never relies on a “one size fits all” approach. Our Goal at Bee Organic is to not just clean your garments, but to restore and return them to you in a “like new” condition! Before any cleaning process begins, each garment goes through a meticulous 7-Point White Glove Inspection. After the inspection our luxury care specialists will be able to determine the best way to treat its unique design. A detailed and precise regiment is then established before it is sent to the appropriate fabric care station. Your garments are cared for using 100% toxin-free and biodegradable solutions that achieve an unmatched clean and professional result. Garments are first form-finished, and then hand pressed to perfection, followed by another final luxury care inspection to ensure nothing has been overlooked. Finally, the garment is packaged either in our complimentary reusable garment bag with form-saving hangers. Our state of the art, German engineered ®Miele Wet Cleaning Machines are the newest, top of the line machines available on the market today. Our machines are in fact not “dry” as these use a small amount of water; nature’s best cleaning solvent combined with a safe biodegradable detergent mixture to remove stains and odors. During the cleaning cycle, drum rotation is minimal as to replicate a hand washing, allowing garments to soak in the organic liquor bath, so the solutions can penetrate the fabrics. This process renders garments not only truly clean, but fresh smelling and the process does not expose our workers or our customers to any harmful toxic chemicals.. At Bee Organic, your garments return to you crisper, cleaner and fresher than ever; plus you cleaning them organically helps to reduce your ecological footprint and keep our planet green! The average American spends around 8.5 hours per month doing laundry. Let us save you an entire days work each month! Drop-off your Laundry at our store, or schedule an in-home pick-up. Choose from an array of options on how you would like your garments cared for. Then we will return your laundry cleaned, neatly organized & folded. We take pride in the laundering of your personal fine linen and cloth wear. Professional care is taken at each step of our process to ensure your laundry is beautifully finished prior to being returned to you. All items are individually inspected and then washed with the gentlest detergents before being finished to our exacting standards. Your crisp clean laundry is then folded and packed ready for you to enjoy. 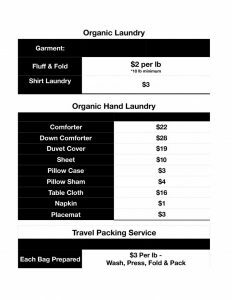 Our organic laundry services includes comforters, bed linens, table linens, towels, lingerie and more. At Bee Organic we understand the value of an impeccably pressed garment, and the importance of first impressions. 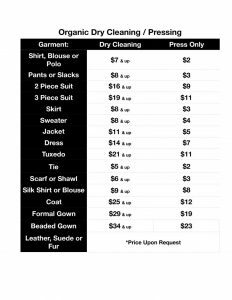 That is why we offer our Pressing Only Service, because sometimes you just need that one garment perfectly pressed before your big day, or that special night out. Once your garment arrives at our shop it is professionally steamed and pressed using the industry’s latest most efficient technology, we also construct a meticulous inspection of the garment after is pressed. Any imperfections are then treated with our professional hand irons, irons that well exceed the quality of pressing that can be achieved with average store bought irons. Pressed garments from Bee Organic can be returned to you on hangers or neatly folded and boxed. Most cleaners can’t tell, or don’t care to know the difference between a bespoke suit or just some suit off the rack. If you ask about their suit cleaning process, it turns out they will not only attempt to clean the garments in harmful and harsh chemicals (slowly deteriorating the fabrics), then they will put it in a big industrial press – which will stamp it flat, ruining any curve in the shoulders, chest canvas or lapels. Thankfully there is an alternative, Bee Organic Dry Cleaners bespoke sponge and press service. This process has been around since Victorian times, and has to be done by hand and involves one of our luxury care specialists lightly sponging the suit clean, before perfectly pressing it with a steam iron. The lining has to be done first, which makes a surprising difference to how comfortable the suit fits. Then the pockets, and finally the outside is pressed – in small sections and rolling the lapels, chest and shoulders. A wooden mould is used in the sleeve to retain its shape. This process can make a suit look and feel like new, as well as preserve the life of the garments. Light colored suits or garments that are heavily soiled, may not be fully cleaned using this process. The Bee Organic staff will advise you on the appropriate process once your garments arrive at our shop. Whether you need your shirts cleaned and pressed everyday for work, or its simply a night out with great friends, your shirt is one of the most noticeable and important parts of your ensemble. Rest assured that each shirt – whether it is silk or 100 per cent cotton – goes through a thorough pre-inspection, grading and treatment process, before being meticulously finished. Let Bee Organic Prepare Your Luggage For You! Simply drop off the garments (dirty or clean) you would like prepared for your trip, along with your favorite suitcase – And we will handle the rest. Whether you prefer your garments freshly pressed and perfectly folded as to create the least amount of wrinkling upon travel as possible, or you have quite a lot of items to pack and would prefer your garments neatly rolled military style as to maximize space and efficiency. We can wash, press & prepare your luggage however your like, for wherever life takes you. CALL Us before YOU ARRIVE AND one of our valets WILL BRING YOUR ORDER OUT TO YOUR CAR. CONVENIENTLY LOCATED IN THE HEART OF THE SOUTH PARK NEIGHBORHOOD. On The corner of pico Blvd. & grand ave.
fREe Delivery in south park. north of olympic blvd. in dtla $3 charge. outside of downtown LA 3$ per mile. Who knew that over 90% of dry cleaners today use chemicals that are classified as a probable carcinogen to humans? Perchloroethlene, also known as “perc”, is the main ingredient in almost all dry cleaning solutions “oh and it is also used as an engine degreaser”. 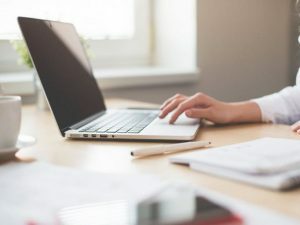 “Perc” is a well known health and environmental hazard that the EPA and the IARC have already classified as a toxin and probable human carcinogen. But wait! There is good news, California will be banning the use of “perc” after the year 2023, yay! And luckily Bee Organic dry cleaners is well ahead of the curve, because we already guarantee 100% toxin-free & “perc” free cleaning agents for EVERY service we provide, right now— for you, your garments and the environment. 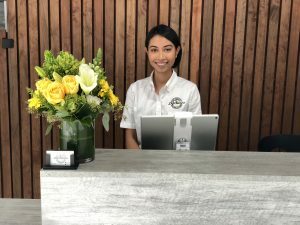 At Bee Organic Dry Cleaners we are happy to answer any questions you may have. Bee Organic Dry Cleaners is conveniently located in the heart of the South Park Neighborhood, Downtown LA. Three block east of the LA Convention Center, on the Corner of Pico Blvd. and Grand Ave. right next door to Starbucks. 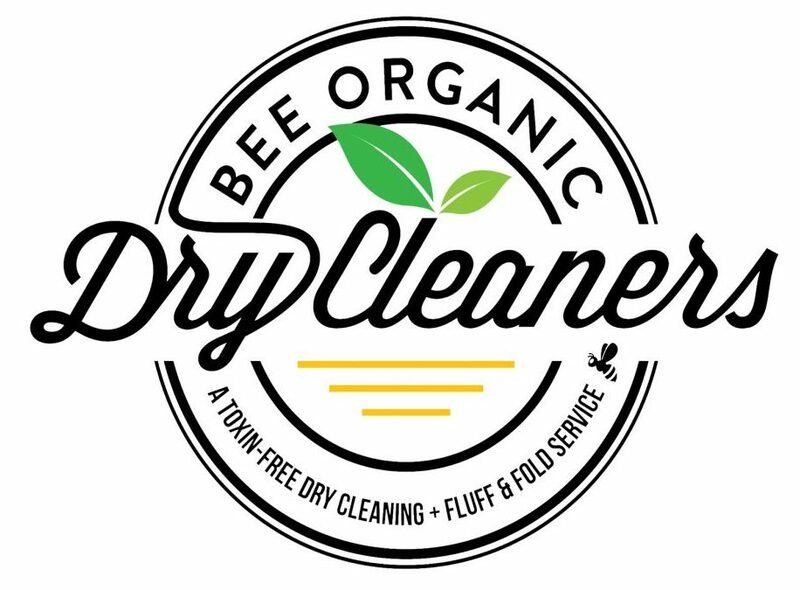 Sign up to become a Bee Organic Member to allow for quick & easy pick-up and delivery of your dry cleaning and laundry services. 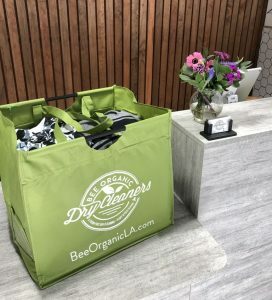 Whether leaving garments with a concierge for daily pick-up at a residential building, or you’re in a rush and would like to simply drop off your clothing at our shop and go – our Member Service is just another way Bee Organic is helping you streamline your organic laundering process!